SB 1021 (Wolk; D-Davis) Split Roll — Discriminates against commercial property through split roll by allowing a school district to impose a higher parcel tax against commercial property as opposed to residential property. The bill is currently awaiting action on the Senate Floor. Click here to read the coalition letter opposing the measure. The bill is a majority vote bill, meaning it only needs 21 votes to pass, so we are very focused on educating Senators about the hugely negative impact this measure would have on the commercial real estate industry. 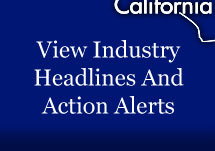 CalWatchdog.com has a great story this week covering the bill, Click here to read it.